US vets set up several small tents and planted a U.S. and Marine Corps flag while sheriff’s deputies watched from behind barbed wire on the hill above. 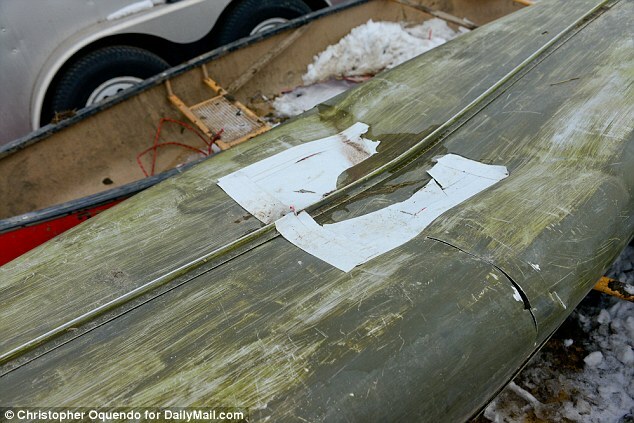 One veteran told that a group of their men had engaged in an operation to rescue canoes belonging to the Sioux people after they were allegedly stolen and smashed by authorities. 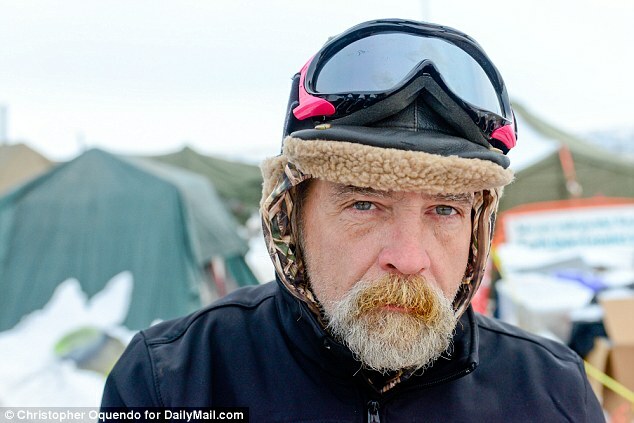 U.S. Army veteran Joseph Hock told: ‘Morton County Sheriff’s Department and the Dakota Access Pipeline people came in the middle of the night and stole canoes which belong to the Sioux. 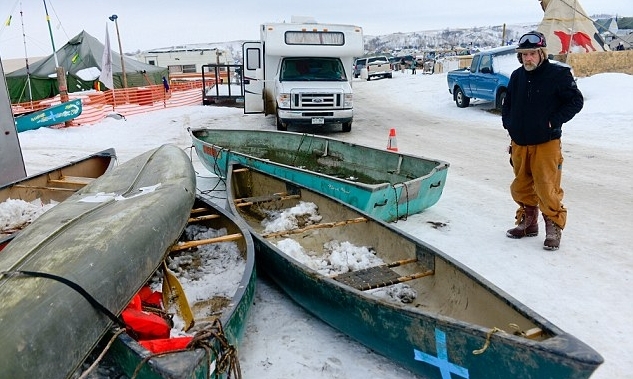 ‘They took the canoes to their side to antagonize and send a message. ‘They broke them up and left them on the other side of the Cannonball River surrounded by concertina wire. 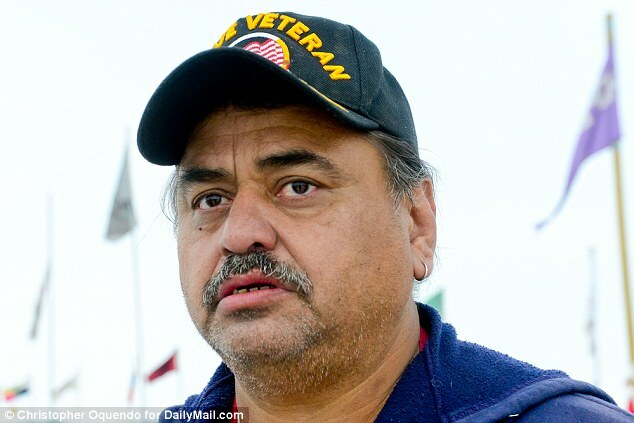 The veteran, who has served in the U.S. and overseas, said that the canoes were used for water rescue. Several of the boats have blue first-aid crosses painted on the side. He said: ‘I think the authorities are trying to create as much distress as possible.’ Many of the boats are beyond repair and cannot return to the water but may be turned into sleds. ‘Part of being sustainable,’ he said. 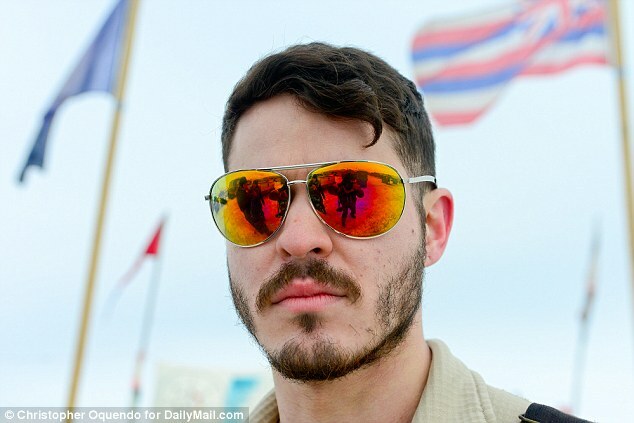 Miguel Tully, an infantry veteran who served in Iraq, said that he had ‘deployed’ to the Standing Rock reservation to protect the peaceful people and take a stand against the injustice of the pipeline. ‘We swore an oath to serve and protect in both foreign and domestic situations,’ he said. ‘Through non-violent actions, we need to show respect to the Sioux people. This is not the first time this has happened to them, they have been disrespected for generations and I hope this will be an end to it. 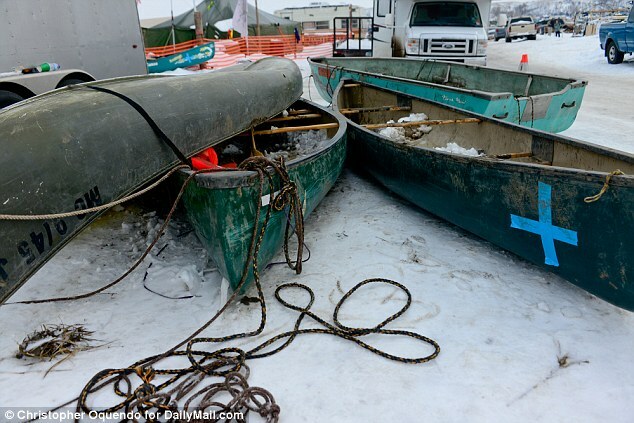 Responses to "Standing Rock: US Vets rescue stolen tribes's canoes from authorities"
You guys ROCK!!!!! STAND STRONG!!!! Thank you from the bottom of my heart. I am a 77 year old digital warrior working from my home, deeply grateful to the water protectors and their veteran allies. Many of us doing what we can from where we live: divesting from the banks supporting DAPL (me from Wells Fargo I just did that), sending donations; requesting donations for you from friends, writing letters to authorities, sharing news and updates with friends not receiving them online, doing whatever we can from our homes. Sending blessings and gratitude. Prayers from St. Ciaran's House of Prayer in the Poconos. God bless you all. I am a veteran too not from the us and I fought an in just war in defense of greed,It is time to put an end to that nonsense,The earth the water and the sun is ours to enjoy and respect, thanks the great Spirit for those gifts of life,whom who trade those essence of life for the greed and the color of green should think,that when those are to far gone, money and oil do not provide for them living cause they can't eat and drink it,So stop what they are doing before it is to late,I am with you from the bottom of my heart,may God bless you. Thank you, veterans. You are awesome. I am feeling so much relief knowing you are there to protect the people there who are suffering so much at the hands of the police, the DAPL security, and the national guard. You are professionals who have your priorities straight. Those other guys are very confused about who the enemy is. Yes! So elated to see this! As a proud member of the Menominee Nation of Wisconsin and a resident of Spokane WA and founder of Veterans for Compassionate Care .... Thank you to the Veterans who are doing the right thing and defending the fabric of our life... water . These wonderful, honorable and true American servicepeople are honoring their oaths to protect against all enemies and to uphold the Constitution. THESE are American military doing what is right, and I thank them for their service. Thank you to all the veterans who saw injustice and responded! Bless you all! Thank you! The police and pipeline companies treat us like we are not Human's . Thank you so much. It hurts the heart to see what these Enforcement people have done and are doing. Thank you! Please keep the updates coming! Standing with Standing Rock! Thanks fellow Vets. I can't make the trip :( but I can keyboard warrior and spread the word. Good mission!. Thank you, veterans, for standing up for what is right. You are correct about the oath you took, and this *is* a domestic threat we are all facing. Don't expect Obama to do his duty, as he has been dropping bombs for 8 years for the oil companies' wars. None of us got to vote on that. I salute you. Well done! Thank you thank you thank you... you are amazing ... my love, my prayers my thanks. I would like to shout out a BIG THANK YOU to our veterans for taking back, from the Morton Thieves Department, what belongs to our Indigenous Brothers and Sisters! Thank you and stand strong against Morton Black Gold Worshipers and Mafia including Kyle Kirchmeier and Governor Jack Dalrymple. The should be arrested for stealing what is not theirs! Thank You Veterans, this is a protecting our water and our life. Thank You to all of the 1st Peoples, all Native Peoples and relatives, and all supporters for protecting what is our water and our life. Oil is greed and pipelines through ancestral lands must stop. Please keep the information coming. Live videos much appreciated. Little to no info has appeared on Facebook for the last three days. Feeling very much in the dark. Thank you all for being there and I hope a million of you eventually show up! God bless and keep you all. To my fellow veterans thanks for your continued service at Standing Rock. Welcome home. First, To the water protectors, then to the reporters, the veterans, (personally to my ELCA Bishop), all who put their lives and their careers on the line: I honor the Standing Rock Sioux who brought this Nation together in Peace, in Solidarity like no other People has been able to do in centuries. You accomplished this with Prayer, by peaceful means without raising hatred, without weapons! Let me repeat that, without weapons! I am humbled, and have hope where it had been crushed since the election. We have much work to do, but we have hope for a better future. Peace on Earth and Good Will to All. Love you Veterans guys (and gals)!! I know you are feeling empowered doing something so positive for we the people and our constitutional rights!! The wonderful Water Protectors built the Tree of Life and the Veterans topped it with a Shining Star. I think this action will go down in history as an event that changed the world as we knew it!! Hoorah to the vets. We pray for them and the people they are now protecting from the possible harm they are facing. The Creator's blessings to all of you. Thank You for Serving.. Then and Now. 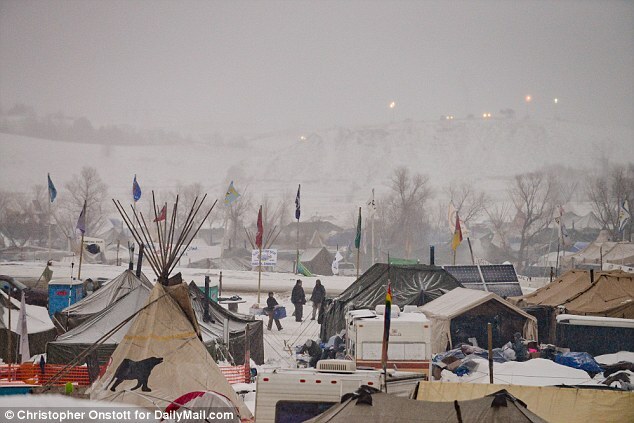 If Energy Transfer Partners builds DAPL without Army Corps permit, shouldn't Morton County & thug cops from 9 states spray the workers and private security with water cannons in freezing temps, hail them with rubber bullets, & douse then in the face with mace? Blessings and a huge thank you, when I heard you were going my heart lifted up... THANK YOU!